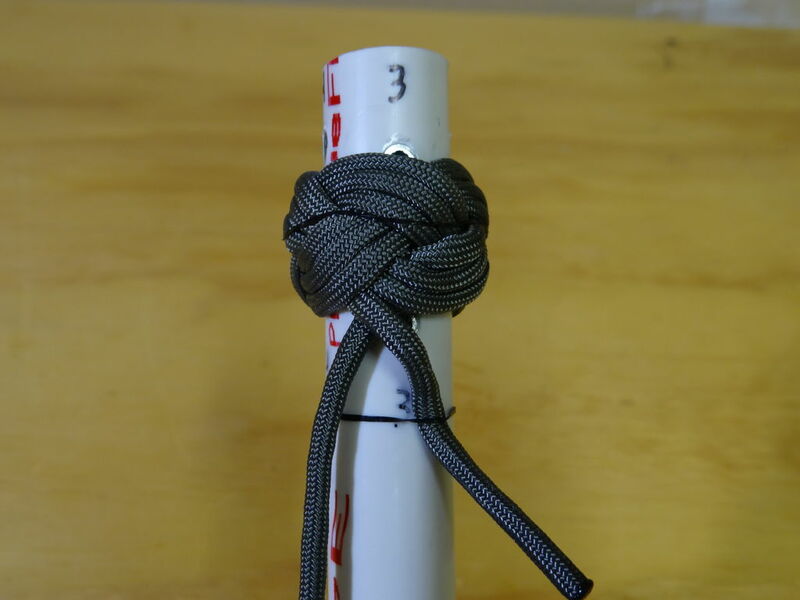 This tutorial will show you how to make turks head knot, more specifically a Boy Scout Neckerchief slide (or a “woggle”). The traditional woggle is a 3 part and 4 bights. Get your turks head tube ready with four screws on the top and four on the bottom. The instructions on how to tie the knot are attached. These are provided by the IGKT (Thank you, IGKT!). You will need about 5-6 feet of paracord. Take one end and rubber band it to the bottom by #1. A paracord threading needle will be helpful when tying this; screw it onto the other end of the rope. On page two of the instructions it says to start at bottom 1, and weave it to top 2. Continue to follow these instructions. After a few passes, you’ll start to see letters U and O. U stands for under, O is for over. When wrapping the rope over the PVC, do not to twist the rope and don’t make it too tight. Once you have completed the turks head, you will end up back at bottom 1. To add a second pass, take the threading needle and follow the same path the rope went on. While staying above the original rope, follow it to top 2. Continue doing this until you are back at bottom 1. By this time, if it is too tight, take the time to add some slack throughout the knot. Now, we will do one more pass, again staying above the other two passes. Follow the rope to the top 2. Continue doing this until you are back at bottom 1. To keep the knot in place, place a hair band around the center of the knot. Keep the hair band holding the original rope down. Remove the machine screws. Using your fingernails, start removing the slack. Start with the rope that is held down by a hair band. Follow it up to 2, and then before you get to bottom 4, tighten the rope a little. Continue tightening all three passes. There are two options when dealing with the ends. One is to melt the ends together. This is not the preferred option because it causes the ropes to cross and it will not look nice. The option described below is to tuck the ends under the knot. We previously left the working end of the rope hanging loose, coming out the middle of the rope. You will have to tuck it under three passes so it sticks out the bottom. Rearrange the rope around to make it appear as if it should be there. Once you have this done, slide the knot to the bottom and flip it upside down. Trim the ends within a 1/4” from the bottom and melt the ends. Carefully, take a hot glue gun and glue the ends down inside the knot. I removed the knot from the pipe just before I glued them down. The knot should be off the pipe by now. Look at it and make sure it is round and that the rope is as tight as possible. Take a cup and add about a teaspoon of white glue. Add a small amount of warm water to dilute it. Mix it well. Place the knot in the cup and make sure it gets covered in glue. Then, take it out of the cup and remove any extra glue by swinging it through the air. Look at the knot and make any final adjustments. Put a pencil through the knot (hanging into a coffee cup) and let it air dry overnight. Repeat the gluing process at least two more times. Feel free to make more than one just in case one gets lost. You can also learn to tie it over your hand if you want too. Here are a few sites to get test your turks head knot skills: IGKT (http://www.igkt.net/beginners/gridmaker.php) and Freekin Sweet Apps (http://freakinsweetapps.com/knots/knotgrid/) and Advanced Freekin Sweet Apps , which has pineapple knot functions (http://freakinsweetapps.com/knots/knotgrid/advanced.html). Any advice about adding a 2nd color (or even a third)? I'd love to have our cubs make blue and gold (or navy blue and rank color if they'd prefer) and the Webelos make 3-Color woggles. I made a single color one during Wood Badge, but always wondered how to get 3 leads in one color in one direction and the 3 return passes in the 2nd color. Hey Michael-what I would do is make two passes with one color (blue), then add a gold rope inbetween the two blues. When you add the gold, you would be on the third step, third picture. It would look nice, but you will have four cord ends to hide when your done. Good luck! There is a way to tie a Turk's head with just your hands. I make them as dog toys. He looks happy :) Great job! Excellent! I need to make some of these.